Use these resources to develop a safe and supportive environment at your school and increase staff morale. Improving school climate can sometimes be an afterthought, but it is an integral piece of a successful school or program. It takes inspired, engaged teachers to ensure students thrive. It takes a safe and supportive environment to nurture student growth. And it takes strong social and emotional skills for students to be positive and engaged participants in their learning environment. Schools and out-of-school programs across the country (and the world) are transforming student success with social and emotional learning (SEL) — and improving school climate at the same time. SEL helps teachers and students manage stress, address and manage student behavior, and foster empathy. You can easily implement SEL within your school or program to reap any or all of these benefits. An impressive body of research proves that SEL improves school climate! Want to get started on your school climate right now? Download a free copy of our Growth Mindset poster! Sometimes, students struggle in school when they are learning new concepts or ideas. Help them reframe the way they think about their growth by using the cues on our Growth Mindset poster. These easy prompts will help your staff build better relationships with their students and help your students build their self-confidence. In turn, morale will flourish! 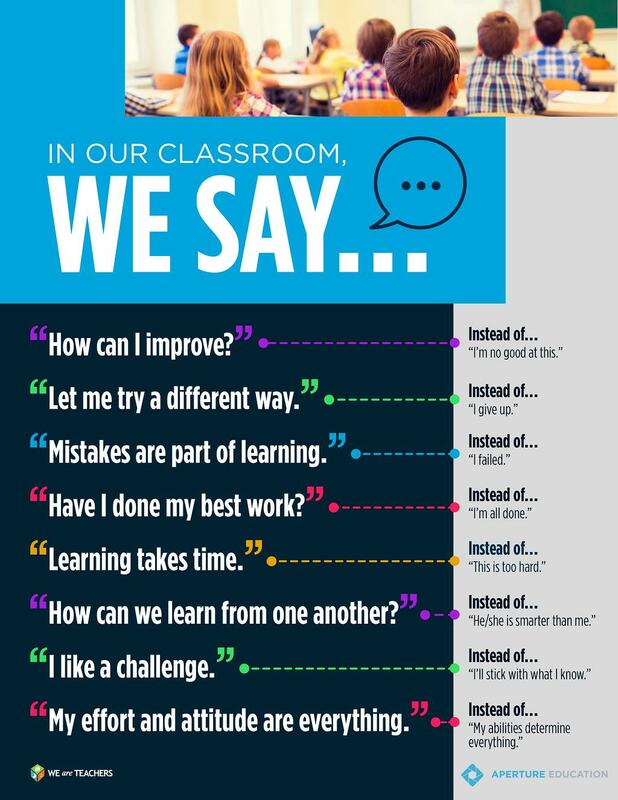 We hope this poster will serve as a conversation starter between you and your staff about the importance of developing a growth mindset. It is easily downloadable and can be printed for your office or sent to your staff to hang in their office or classroom. "What does a positive school climate actually look like? Take a moment to paint a picture in your mind. Is it teachers who have enough time to plan for their students' learning while also being allowed time to cooperate and plan with one another? Maybe it's a place where staff, students, and families feel comfortable collaborating and sharing their ideas to ensure the school is supporting everyone's needs. Take a moment to write down 5 things you think represent a positive school climate." The Collaborative for Academic, Social, and Emotional Learning (CASEL) has compiled a library of resources focused on promoting SEL for educators. These articles, books, and videos will increase teachers’ resilience and help them become happier and more effective. According to the National School Climate Center, an important measure of school climate is interpersonal relationships, a core competency of many SEL initiatives. You can read more about the NSCC's guidelines for creating a safe and supportive school environment here. This report from the Wallace Foundation provides school principals with 5 Key Responsibilities that can be immediately implemented to guide students and staff in the right direction. We know that school and out-of-school leaders are increasingly thinking about how to improve their school/program culture and climate. That’s why we've put together a session to help you do just that. Join us as we hear from Rutgers University's Danielle Hatchimonji, Social-Emotional and Character Development Associate Lab Director. - Easy ideas to get started at your school right now! Aperture Education's DESSA Comprehensive SEL System is a nationally-recognized, evidence-based assessment and intervention system that provides accurate and informative data on students' social and emotional strengths and needs. The Devereux Student Strengths Assessment (DESSA) is a reliable and validated SEL assessment that can be used as an early-warning indicator, universal screener, and progress monitor. How can a SEL assessment help your school climate and culture initiative? Fill out the form, right, to demo the DESSA System. In this demo, you'll learn about the many benefits of integrating SEL within your school.